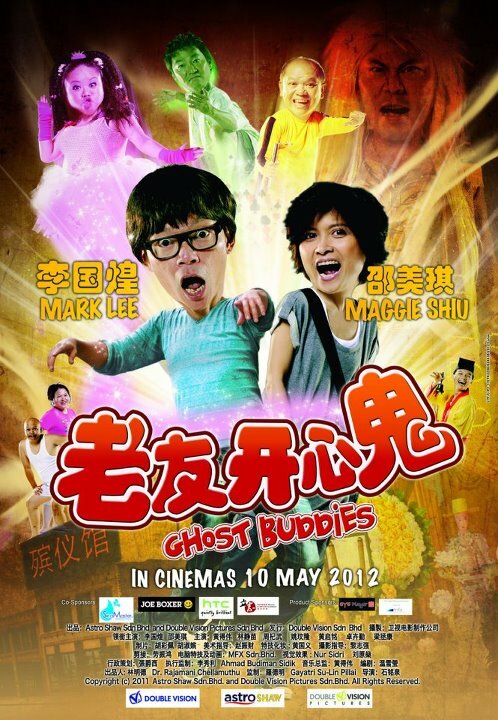 Yet another Chinese movie that I manage to catch and it has some Hokkien dialogues in it as well! Mark Lee plays Hui, a make up artist worker at a funeral parlor who's infatuated with his mentor who has a mole on her face and smokes. One fine day, he seems to be able to see ghosts but dismiss it that it's just his imagination. His condition grew stronger and stronger and pretty soon, he starts seeing ghosts around always and somehow he started communicating and making friends with some of them. 3 of his ghost buddies had turned into his best friends. 1 is a gambler who was in debt with the loan sharks but always longs to see his family again after death. Another is a fashionable uncle who longs for his girlfriend where his sons know not much about him. One more is a fat lady who loves to dance and wanted to compete in dance competitions but was opposed by her parents. All of them had unfulfilled wishes where Hui eventually gave in to help them and in return, the 3 ghosts help him out as well............or is it? Despite the realism of him communicating with the ghosts, it seems that people around him seems to think otherwise. This show is one of the most funny Chinese movie for 2012 that I've seen. The many witty conundrums and play with words seem to work well for the humor. I personally like it a lot and the way they cast doubts at the end for an open ended ending is clever. I would rate this movie 3.5 stars out of 5.
i dont like this movie. which part you feel is funny to you? I don't like silly movies. I don't like Stephen Chow and Jim Carrey. I don't think I'll like this movie..
yep Niccchang, agree with u. The witty comments and the stupid actions cracks me up. Haha. If you don't like the likes of Stephen Chow and Jim Carrey, then this show is definitely not for you. So you rate at 2.5 stars eh? I gave them an additional star because it's watchable. 2.5 stars to me is leaning towards boredom.